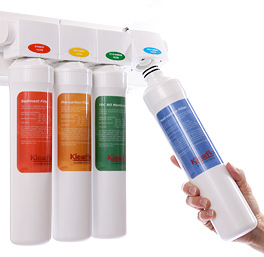 The KlearFlo Reverse Osmosis with 1/4 turn quick-change cartridges is simply the 'best' of the best! 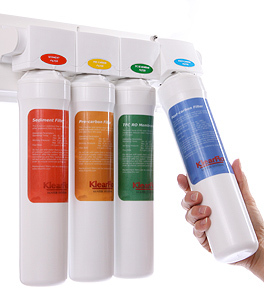 Unlike conventional reverse osmosis systems, KlearFlo Reverse Osmosis with quick-change cartridges have no sumps, so their proprietary filter elements and membranes are easy to replace. Cartridges are connected and removed with a simple 1/4 turn. No filter sumps! No fuss! No mess! Tank and faucet options available. Conventional RO system cartridges and membraines are difficult to replace because they are installed in housings and must be removed. This procedure includes the need to shut off and drain down the system, open the housings with a wrench, remove the inner cartridges, empty water from the sumps, clean the filter and membrane housings, replace cartridges, re-pressurize, and check for leaks. Because conventional systems are difficult to service, routine maintenance may be delayed. Therefore, consumers may not get the quality water they desire, unless a qualified dealer is called to service their system; costing the consumer more money. KlearFlo 'quick-change' RO system has NO Sumps! NO Mess! NO Fuss! Hinge bracket for easy handling. Automatic shut off when cartridges are removed with a simple 1/4 turn. No need to disconnect tubing when replacing membranes. Integrated check valves between cartridges and membrane prevent back-flow. Cartridges have double o-rings so they will not leak. Quick connect fittings for easy installation. Sediment Filter - This sediment filter reduces sand, silt, soil and other sediment particles down to 5 microns. 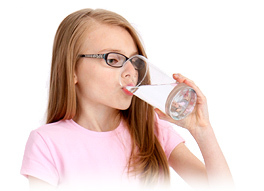 Pre-Carbon Filter - This pre carbon block filter is made of high grade activated carbon which will reduce chlorine, remove bad taste and odor from the water. 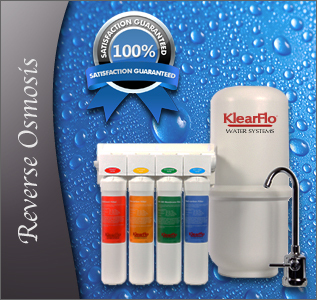 Reverse Osmosis Membrane - The work horse of the water purification system, this RO membrane reduces water impurities down to 1/10,000 or .0001 of a micron. 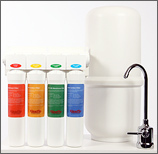 Effectively removing nitrates, arsenic, chromium 6 and much more. Post-Carbon Filter - This post carbon filter is made of high grade activated carbon which will crispin up the water and ensure highest quality of drinking water. 1st stage Sediment and 2nd stage Pre-Carbon should be scheduled for replacement every 6 months. 3rd state Membrane can last between 2 to 5-years; depending on usage. However, for optimum performance we recommend replacement every 2 years. 4th stage Post-Carbon should be scheduled for replacement every 1 year. KlearFlo Water Systems warrants to the end user (customer) that it's Reverse Osmosis assembly, holding tank and faucet will be free from defects in material and workmanship under normal use and service for the life of the system. No warranty is made with respect to defects or damaged due to neglect, misuse, alterations, accident, misapplication, physical damage, installation on water quality outside guidelines for system or damaged caused by fire, acts of God, or freezing.